Universal Studios Hollywood bills itself as “The Entertainment Capital of L.A.” Famous for combining their film studio with a massive theme park, guests get a behind the scenes look at a real life working studio, see iconic movie sets from the past, and immerse themselves into their favorite worlds like Harry Potter through the Wizarding World or Springfield USA, home of The Simpsons. Universal Studios brings these franchises and others to life, which offers fun for all-ages, all year round. That said, like all theme parks, the time and money to visit is a big investment. You know it’s going to be a full day and night excursion. There will be crowds, long lines, fussy children and over-priced everything. Take some control back into your hands and turn your day at one of the most popular theme parks in California into a seamless good time with our nifty list of tips on how to navigate Universal Studios Hollywoods like a pro. Trust us, a little preparation and planning will go a long way! 1. Avoid busy ticket lines by ordering tickets online in advance. Prices are usually cheaper online ranging from $99 to $129 for general admission. 2. Unsure what day you’ll be going to the park? Purchase Anytime Admission tickets online for some flexibility. This ticket allows you to visit on any date of your choosing. 3. Online ticket purchases will also give you Early Park Admission to The Wizarding World of Harry Potter. Early Park Admission begins one hour before the park opens and is subject to availability. Visit the park calendar to see future availability. 4. Get the Universal Express Pass. It gives you front of the line access to all attractions and shows which cuts your wait time by more than half. This is especially important during busy times like the weekend or holidays. Prices run $169 and up depending on the day. If the price difference from GA is negligible to you (and it’s not to everyone), then we strongly recommend the Express Pass. 5. Children two years old or younger enter the park for free without a ticket. But keep in mind that there are height requirements for a number of rides. 6. There’s a Universal Studios Hollywood VIP Experience package where you get valet parking, a personal guided tour of the park, unlimited priority access to rides and shows, breakfast in a private VIP lounge, backlot access to sound stages, prop warehouse, and other restricted areas, plus a gourmet all-you-can-eat lunch at the Moulin Rouge dining room. There is limited availability for this package and you must book in advance. Children under 5 are not allowed for this offer. Currently prices range $349 and up depending on the day. 7. Going with a big squad? The park offers group discounts for 10 people or more. Call 1-800-959-9688 for more information and to reserve tickets. 8. Do not buy tickets from third party resellers. Buying directly from the park ensures that ticket are valid and authentic. 9. If it can be helped, avoid days where children are out of school like a holiday or the weekend. 10. The busiest seasons are the summer with spring in second and fall and winter being the least congested. 11. Check the Universal Studios Hollywood calendar to see which celebrities might be in the area. EXTRA is usually filmed at the Globe Fountain found at the front of the park entrance and The Voice is film on the studio grounds. Celebrity sightings during the famous tram ride are possible as well. 12. Go early in order to beat the heat and crowds in the warmer seasons. Early park guests all year round get the whole experience of Universal Studios Hollywood without the massive crowds that tend to enter the park later in the day. 13. Head to the Wizarding World of Harry Potter first. It’s located at the front of the theme park and that area can become extremely crowded later in the day. 14. The park is divided into an Upper and Lower Lot. The Lower Lot (the smaller of the two) is usually less busy but it also have two of the most exciting rides; Transformers: The Ride 3-D and Revenge of The Mummy The Ride with a third, Jurassic World set to open in 2019. Keep in mind that depending where you start from the walk from Upper to Lower may take you 10 to 15 minutes. Try to build out your day so you’re not shuttling back and forth from one lot to the other, as this can be tiring and takes up valuable time. 15. The Universal Studios Hollywood app is a helpful guide to the park right in your phone. 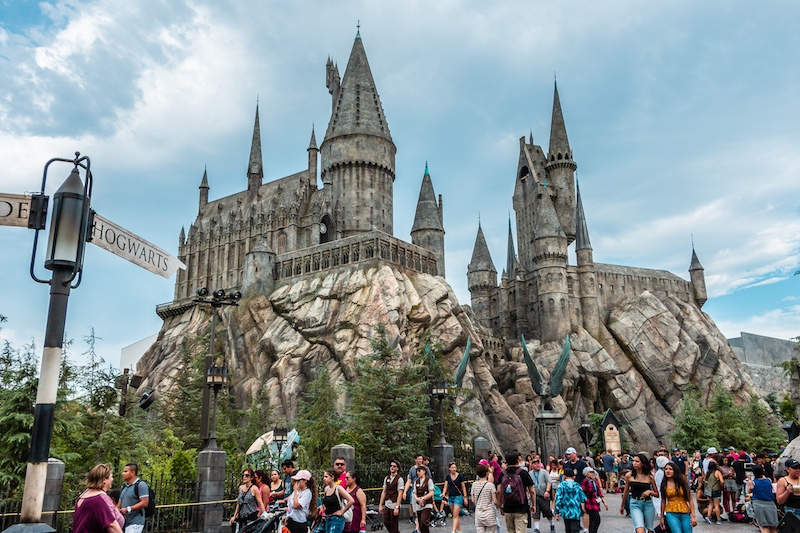 The app helps guest find upcoming shows, estimate ride wait times, locate restaurants and shops, as well as small performances like the Triwizard Spirit Rally performances and character meet and greets. 16. The park offers free WiFi. Use it to visit the wait times webpage here while visiting the park. Or download the app. 17. All the excitement of a theme park will leave you dehydrated. Bring an empty water bottle into the park and fill it up at water fountains inside the park. This is also a great tip to avoid being over charged for water at concession stands. 18. Going to the park with non-english speakers? Studio Tours are offered in both Spanish and Mandarin every day. Visit Guest Relations for tour times. 19. Single Riders Line is a great option for those who don’t care if they split up from their group. It’s the fastest way to get on a ride. The following has single rider options: Harry Potter and the Forbidden Journey, Flight of the Hippogriff, Revenge of the Mummy – The Ride and Transformers: The Ride 3D. 20. The park offers a “child switch” program. If a child in your party cannot ride an attraction, one or two adults can wait with the child in the attraction’s Child Switch room. When the rest of your party returns, they simply switch with those who were waiting with the child, without having to wait in line again. Inquire with a park team member at the entrance of an attraction and they will assist you. 21. Ollivanders Wand Shop does not accept an express pass. It is longest in the morning when kids and adults are buying their wand for the day. Wands are able to perform magical spells at most of the Harry Potter world store front windows. 22. The Wizarding World of Harry Potter is AWESOME. You’ll be transported into the magical world the minute you step in. Explore the many shops of Hogsmeade, throw back a couple Butterbeers and get yourself a wand at Ollivanders. This is a good place to splurge a little if you’re a die hard Potter fan. Rides include Harry Potter and the Forbidden Journey located inside of Hogwarts castle. You’ll see the great hall, the Sorting Hat, Hogwarts Portraits and more. The ride is a little scary so beware. The second ride is a family friendley outdoor coaster called Flight of the Hippogriff where you’ll riding on a Hippogriff (Hagrid’s magical pet) around a pumpkin patch. 23. The Studio Tour is now action packed! Guests will be taken around the studio lower lot where some of the most iconic movies have been filmed like JAWS and Psycho. Fairly new is a ride along with the cast of Fast & The Furious the hyper-realistic journey with loads of special effects, 3D-HD, 4-D all projected onto the world’s most expansive 360-degree screens will transport you into a crazy car chase adventure. But wait… there’s more. You also get to experience a very intense King Kong 360-3D experience created by Peter Jackson. Considered to be the worlds largest 3-D experience, guests will be caught in the middle of a heart pounding fight to the death between King Kong and a 35-foot T-Rex. Keep your belongs close to you on both 3-D experiences, you’ll be rocking side to side a lot on both rides. Head to the tour when your legs begin to tire and you need a period of rest (but still want a little excitement!). 24. 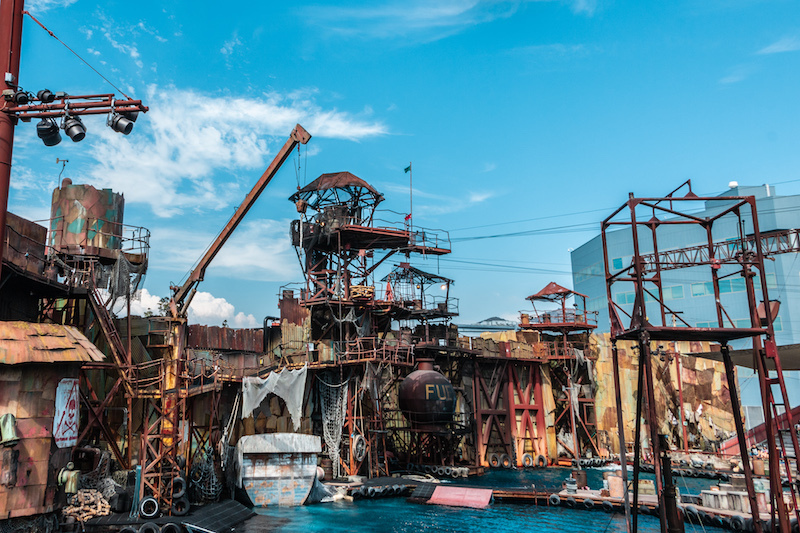 WaterWorld is still one of the most popular shows in the park. Run time is 20 minutes. Head over to the show when you need a break from walking or standing. Do not sit in the splash zones unless you want to get seriously wet. The show’s cast members are not shy about dumping buckets of water on guests. You’ve been warned. 25. Revenge of The Mummy: The Ride is located in the lower lot of the park. Be prepared to go up to 45mph into virtual darkness with ancient horrors lurking at every turn. All riders must place their items in the free lockers located next to the ride entrance. 26. Transformers: The Ride 3-D located in the lower lot is one another popular ride in the park. Spot Optimus Prime and Bubble Bee outside giving a heroic speech, a great spot for photo opps before entering into the world of Autobots vs. Decepticons where you’ll be tasked to protect the Allspark. 27. The old Jurassic Park ride closed on September 3, 2018. The park plans update the ride as Jurassic World in 2019. 28. Bring a swimsuit for the little ones. There’s a Wet Zone area called Super Silly Fun Lands, with over 80 water play features near the Despicable Me attraction. A perfect cool down option in the summer time. 29. Night Time Lights at Hogwarts Castle is a dazzling light show using the castle as the backdrop. Available during summer. If you can’t make it then, don’t worry the light show returns every year. There’s also a holiday edition in the winter time too. 30. The annual Universal Studios Halloween Horror Nights starts in mid September and runs through the first week of November. See some of the most iconic monsters come to life during this popular Halloween series. You’ll experience spine chilling mazes usually themed from the latest Universal horror flick, live shows, scare zones and the Terror Tram experience where the studio tour tram ride takes a very dark turn. Be prepared to take a stroll off the tram during Halloween Horror Nights. This year the Terror Tram theme is Hollywood Harry’s Dreadtime Storiez based on the 1950’s demented clown infamous for terrorizing the Universal Studios backlot. Additional 2018 attractions include Stranger Things, Trick ‘r Treat, The First Purge maze, Halloween 4 maze and much more. 31. Christmas in The Wizarding World of Harry Potter is truly a special occasion. Expect Hogsmeade to be decorated in Christmas decor, holiday themed food, drinks, snowfall and The Magic of Christmas at Hogwarts Castle a dazzling projection show that wraps around the castle. “Christmas in The Wizarding World of Harry Potter” will take place daily from November 17, 2018 through January 6, 2019. 32. For 2018, the holidays will see the return of “Grinchmas” an annual event featuring a 60-foot tall “Grinchmas” tree and performances by Martha May Who-vier and the Who-liday Singers. “Grinchmas” will take place weekends on December 1-2 and 8-9, and daily from December 14 through December 30, 2018. 33. New Year’s Eve at Universal Studios Hollywood will host multiple party areas with music, dancing, drinks, special souvenirs and a midnight countdown celebration with fireworks. 34. Lunar New Year is also a fun time to go to the them park. Meet characters like Po and Tigress from Kung Fu Panda, Illumination’s Minions in traditional Chinese attire and a Mandarin-speaking Megatron from TRANSFORMERS. For 2019 you’ll also see a Dragon Warriors Kung Fu training show, Mr. Ping’s Noodle Shop, live themed performances and more. 35. For the most up to date list of all rides and attractions, checkout the USH official site. 37. Three Broomsticks in Wizarding World is set up as the rustic tavern where Harry Potter first took a sip of Butterbeer. You can do the same and feast on Hogwarts approved British fare. The menu includes Bangers & Mash, Shepherd’s Pie, Fish & Chips and Beef Sunday Roast. If you have four people with you, consider “The Great Feast” a tray bursting with ribs, roasted chicken, corn on the cob, roasted potatoes and steamed vegetables. 38. If you’re a Harry Potter fan you have to get a taste of Butterbeer. It comes frozen, hot, cold on ice and taste like cream soda and caramel. The frozen Butterbeer is the best one in our opinion. Skip the long lines at the kiosks and go inside Hogs Head Pub. There you can also order the exclusive Hog’s Head Brew or Pumpkin Juice, Gillywater (aka bottled water), wine, spirits, cocktails and a selection of beers. 39. Springfield U.S.A. carries one of the most immersive food options in the park showcasing eateries, bars and items from the show. Guests can dine on Krusty-certified meat sandwiches at Krusty Burger like the Sideshow Bob Foot Long, Clogger Burger, Ribwich and the classic Krusty Burger. Moe’s Tavern is the perfect watering hole to score some real Duff beer and even a Flaming Moe. While you’re there, snap a picture with some of the bars most valued customers like Barney Gumble! There’s a Duff Brewery Beer garden and located next to it is Bumblebee Man’s Taco Truck. 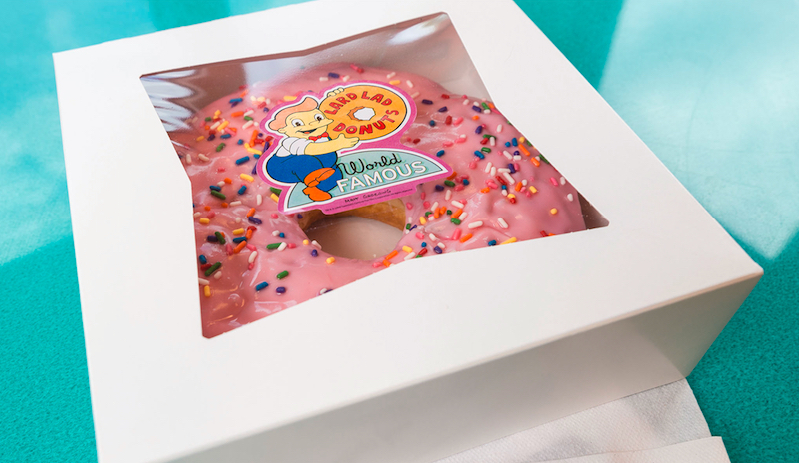 Lard Lad Donuts is where Homer’s favorite iced pink donuts with sprinkles can be found. In the park they are giant, making it fun for sharing and having a photo moment with. 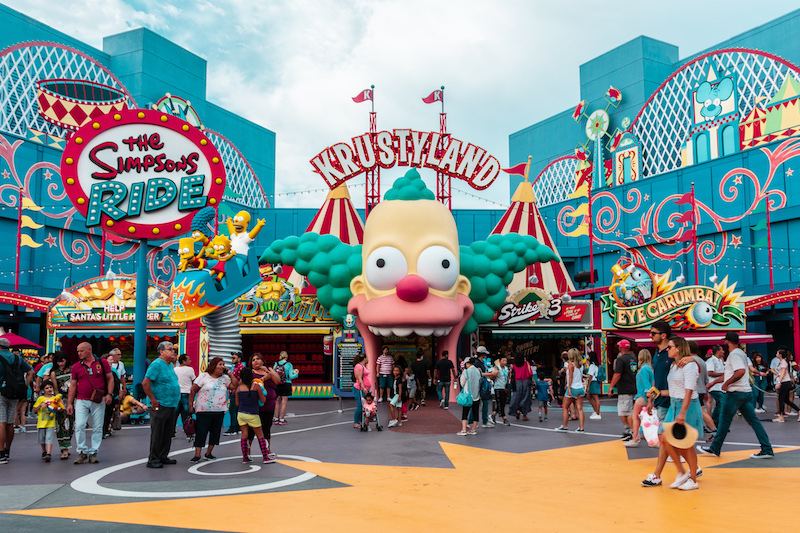 Suds McDuffs Hot Dogs carries memorable items from the show like Krusty’s Non-Kosher Hot Dog Kombo, Marge’s Twisted Pretzel, Ralph Wiggum’s Choo-Choo Churro and Buzz Cola. Hankering for some fried chicken? Head to Cletus’ Chicken Shack for a Chicken and Waffle sandwich, Chicken Platters and something called Chicken Thumbs. Luigi’s Pizza offers hot and fresh pizza by the slice and an entire pie. Phineas Q. Butterfat’s Ice Cream shop will have you indulging on Ice Cream Swirl ‘n’ Hurl, Ice Cream Conans, Brain Freezin’ D’oh-Nut Sundaes and more. 40. To maximize your time you are allowed to bring your food into Universal’s Animal Actors and WaterWorld shows. 41. CityWalk also has many food options such as Voodoo Doughnut, Karl Strauss, and Margaritaville. 42. You can go in and out of the park. Lines for food will be less extreme at the sit down options at City Walk. Don’t forget to get your hand stamped and hold onto your ticket.